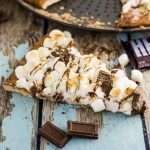 S'Mores Pizza with tons of gooey marshmallows, creamy HERSHEY'S Milk Chocolate with a marshmallow cheesecake sauce, a chocolate drizzle, and a sprinkle of graham crackers, all on top of a cinnamon-sugar crust. Roll out pizza crust onto a large pizza pan or baking sheet. With a pastry brush, brush melted butter onto crust. In a small bowl, combine 3 tablespoons sugar and 1 tablespoon cinnamon. Sprinkle cinnamon-sugar to cover buttery pizza crust. While crust is cooking, combine softened cream cheese, powdered sugar, vanilla, and marshmallow fluff in a large mixing bowl. Whisk until smooth. Spread cream cheese mixture onto pizza crust. Add toppings on top of sauce. Add HERSHEY'S Milk Chocolate Bars (broken into pieces) and marshmallows liberally. Bake for an additional 10 minutes until cooked and heated through. If you want to make your marshmallows look toasted, turn on the broiler for the last minute. Watch carefully so that you marshmallows don't burn too quickly. Remove from oven. In a small bowl, melt the last bar of HERSHEY'S Milk Chocolate. Place in a plastic baggy. Cut a small corner off the bag, and drizzle melted chocolate on top of the S'Mores pizza. Let set for about 10 minutes before cutting and serving. Serve warm so the marshmallows and chocolate stay gooey! Enjoy!